The yourCEBA surgical instrument cleaning detergents, surgical instrument enzyme cleaners, and surgical instrument lubricants consistently deliver residue free medical devices. Surgical instrument cleaning detergents that lubricate while they clean cut costs for reprocessing soiled medical devices. Surgical instrument cleaning detergents that lubricate clean faster and clean residue free. The yourCEBA surgical instrument cleaning detergents, instrument enzyme cleaners, and instrument lubricants consistently deliver residue free medical devices. The all-in-ONE surgical instrument cleaning detergents deliver the four enzymes necessary for removing all forms of proteinaceous bioburden and the surfactant detergents to clean the surface after the enzymes break down the soil. 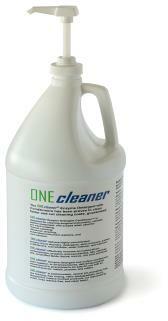 The all-in-ONE is highly concentrated for fast and cost effective cleaning. The all-in-ONE surgical instrument cleaning detergents are: non-irritating, biodegradable, phosphate free, and neutral pH. The cost cutting all-in-ONE highly concentrated surgical instrument cleaning detergents significantly decreases the amount of product being used, reduced weight (per effective volume) significantly reduce shipping and handling costs, combining enzyme and detergent cleaning treatments speeds turnaround (decontamination) times, lower inventory and acquisition costs by replacing multiple products and reducing purchases, improving the performance of surgical instruments and scopes extends their functional life span. The all-in-ONE highly concentrated surgical instrument cleaning detergents deliver an average concentration that is 400% higher than the other enzyme detergents. 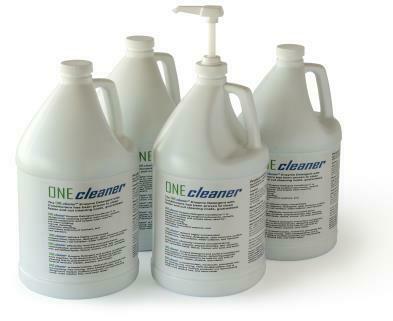 One gallon can deliver 512 gallons (1938 liters) of cleaning and conditioning power.The ONEcleaner surgical instrument cleaning machine washer sterilizer detergents and highly concentrated enzymatic surgical instrument detergent, deliver effective ultrasonic surgical instrument cleaning solutions that clean residue free. for use with decontamination work sinks, ultrasonic cleaning, and other cleaning workstations. The ONEcleaner enzyme detergent surgical instrument cleaners are used for pre wash soaking, manual cleaning, ultrasonic surgical instrument cleaners, scope washers, and as a power boosting surgical instrument washer disinfector detergent. ONEcleaner enzymatic surgical instrument cleaners deliver enzyme cleaners and surface cleaning detergents, that clean residue free.